Nickname(s): "Leather Ceety o Indie"; "Manchester of the East"
Kanpur pronunciation (help·info) (Hindi: कानपुर, Urdu: کان پور‬‎), spelled as Cawnpore afore 1948, is the tent maist populous ceety in Indie an the lairgest athin the state o Uttar Pradesh. It is the lairgest ceety o the Hindi-speakin belt efter Delhi. It remains ane o the auldest industrial towunships o North Indie, awtho it haes no kept pace wi IT industry growthe in the rest o Indie due tae poleetical indifference. It haes a metropolitan aurie o ower 1,640 square kilometres (630 sq mi) an a ceety aurie o aroond 829 km2 wi an approximate poplation o 5 million indwallers. The status o the ceety wis upgradit when it wis includit in the "Coonter Magnets" o Naitional Caipital Region (NCR). Kanpur is ane o the fastest growin ceeties in Indie especially the industrial growthe in the first decade o the 21st century is phenomenal supportit bi the fact that the nummer o industrial units that wur aroond 14,000 in the year 1998 haes amaist mair nor doubled tae nearly 29,000 bi 2009 juist in 10 years duration which is exceptional growthe. ↑ "Kanpur Nagar". World Gazetteer. Retrieved 8 June 2010. 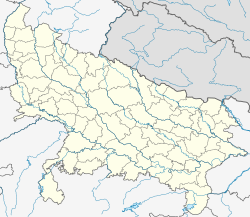 ↑ "235 Related Topics about Kanpur". Retrieved 2012-01-10. ↑ "PATENTS FILED, GRANTED | SIDBI Innovation and Incubation Centre". Siic.iitk.ac.in. Retrieved 2012-12-19. ↑ "178 Related Topics about Yekaterinburg". Retrieved 2012-01-10. ↑ "City of Milwaukee - Meeting of SISTER CITIES COMMITTEE on 9/29/2010 at 1:30 PM". Milwaukee.legistar.com. Retrieved 2012-12-19. Wikimedia Commons haes media relatit tae Kanpur.